Whispers in the Loggia: "Convert Us Unto Thee, O God"
Beginning the traditional cycle of Rome's Station Churches, in keeping with the long-standing custom of the pontiffs, B16 celebrated evening Mass on this Ash Wednesday in the basilica of Santa Sabina, the mother-church of the Dominicans. 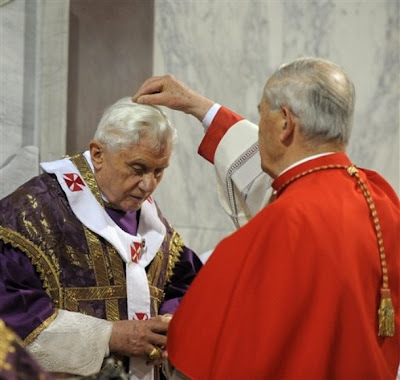 Per the day's ancient ceremonial -- which once saw his predecessors walk barefoot up the Aventine Hill prior to the liturgy -- the Pope was marked with the penitential burnt palm by the 5th century church's cardinal-titular, the retired "Red Pope" Cardinal Jozef Tomko. Today we begin the liturgical season of Lent with the impressive ritual of the imposition of ashes, through which we undertake to convert our hearts to the horizons of Grace. In general, the common opinion is this time is likely to be characterized by sadness, the greyness of life. Instead it is a precious gift of God, it is a time of strength and full of significance in the journey of the Church, it is the road to the Lord's Passover. The Biblical Readings of the day offer an indication of how to live this spiritual experience. "Come back to me with your whole heart" (Joel 2:12). In the first reading from the book of the prophet Joel, we heard these words with which God invites the Jewish people to a sincere and not an empty repentance. This is not a superficial and transient conversion, but a spiritual journey that covers in depth the attitudes of conscience and presupposes a sincere act of repentance. The prophet is inspired by the plight of the invasion of locusts that had befallen the people by destroying their crops, to invite an interior penance, to tear the heart and not garments (cf. 2.13). That is, to implement an attitude of genuine conversion to God - to return to Him - by recognizing His holiness, His power, His majesty. And this conversion is possible because God is rich in mercy and love. His mercy is all-renewing, which creates in us a clean heart, bringing new life to our spirit, giving us the joy of Salvation. God does not want the death of the sinner, but that he be converted and live (cf. Ez 33:11). Thus the prophet Joel orders on behalf of the Lord, the creation of a proper penitential environment – which is like a trumpet awakening consciences. The Lenten season offers us that liturgical and penitential environment: a journey of forty days in which to experience the merciful love of God. Today we hear again the call "Come back to me with your whole heart", and today we are being called to convert our hearts to God, always conscious of not being able to complete our conversion ourselves, by our own power, because it is God who converts. He still offers us His forgiveness, inviting us to return to Him, giving us a new heart, purified from the evil that oppresses it, for us to share in His joy. Our world needs to be converted by God, it needs His forgiveness, His love, it needs a new heart. "Be reconciled to God" (2 Corinthians 5:20). In the second reading St. Paul gives us another element in the path of conversion. The Apostle calls us to lift our gaze from him and pay attention instead to who has sent him and the content of his message: "So we are ambassadors for Christ, as if God were appealing through us. We implore you on behalf of Christ, be reconciled to God"(ibid.). An ambassador repeats what he has heard spoken by the Lord and speaks with the authority and within the limits that he has received. Those who have held the position of ambassador does not attract attention to himself, but is at the service of the message that has been sent and He who sends him. So this how St. Paul behaves in carrying out his ministry as a preacher of the Word of God and an apostle of Jesus Christ. He does not flinch in the face of the task given him, but goes about it with complete dedication. He invites all to be open to grace, to let God convert us. "Working together then, - he writes - we appeal to you not to receive the grace of God in vain"(2 Cor 6:1). "Christ's call to conversion - says the Catechism of the Catholic Church - continues to resonate in the lives of Christians. [...] It is the continued commitment to the whole Church, which "includes sinners in its bosom ", and that is "at once holy and always in need of purification, to follow constantly the path of penance and renewal." This endeavour of conversion is not just a human task. It is the movement of a "contrite heart" (Ps 51.19), attracted and moved by grace to respond to the merciful love of God who loved us first "(No. 1428). St. Paul speaks to the Christians of Corinth, but through them he speaks to all people. For all have need of God's grace, to enlighten their minds and hearts. And the Apostle insisted: "Now is the time, now is the day of salvation" (2 Corinthians 6:2). All are open to the action of God, his love. With our Christian witness, we Christians must be a living message, indeed, in many cases we are the only Gospel that people today still read. Here is our responsibility in the footsteps of St. Paul, here's one more reason to live this Lent well: to offer a living witness of faith in a troubled world that needs to return to God, a world which needs conversion.
" Take care not to perform righteous deeds in order that people may see them; " (Matt. 6:1). Jesus, in today's Gospel, reinvigorates the three major works of mercy under the law of Moses. Almsgiving, prayer and fasting are the three foundational works of piety under Jewish law. Over time, these provisions had been eroded by a rigid external formalism, or even mutated into a sign of superiority. Jesus highlights in these three works of mercy a common temptation. When you do something good, almost instinctively comes the desire to be respected and admired for the good deed, to have that satisfaction. On the one hand this makes you close in on yourself, and at the same time, removes you from yourself, because it is completely directed towards what others think of us and admire in us. In proposing these requirements, the Lord Jesus did not require a formal compliance with a law alien to man, imposed by a severe legislature as a heavy burden, but invites us to rediscover these three works of piety, living them in a deeper way, not for our own love, but for the love of God, as a means on our the path of conversion towards Him. Alms, fasting and prayer: this is the path of divine pedagogy that accompanies us, and not only in Lent, to our encounter with the Risen Lord, a path to be followed without ostentation, in the knowledge that our Heavenly Father knows how to read and see the inner depths of our hearts. Dear brothers and sisters, we begin our Lenten journey with trust and joy. Forty days separate us from Easter, this is a powerful time in the liturgical year, and it is a special time that is given to us to look, with greater commitment, to our conversion, to listen more attentively to the Word of God, a time for prayer and penance – of opening our hearts to the workings of Divine will, for a more generous practice of mortification, thanks to which we can be more attentive to neighbours in need: it is a spiritual journey that prepares us to relive the Paschal Mystery. May Mary, our guide in our Lenten journey, lead us to an ever deeper knowledge of Christ dead and risen, help us in our spiritual battle against sin and support us in calling out with all our strength: “Converte nos, Deus salutaris noster” -- "convert us unto thee, O God, our Savior." Amen!